Adding to yesterday's thoughts on backstory, Cory Doctorow's podcast novel, Eastern Standard Tribe, uses a different method of revealing backstory. Like Warren, he starts his novel in medias res and goes backward, after setting the hook, to establish a little about who his character is and why he's there. A couple of differences, though. Doctorow opens the story at the character's crisis -- or the Inmost Cave in Hero's Journey lingo -- the character's darkest moment. His backstory begins at the beginning of the plot; he even leaves off the Ordinary World and begins with the first plot point, or the Entry into the New World (the traffic accident with the future girlfriend). Eastern Standard Tribe is a lighter novel than All the King's Men, and I'm sure Doctorow would be the first to point out that he's not a U.S. Poet Laureate writing a Pulitzer Prize-winning novel. But there's a difference in audience as well, and Doctorow's futuristic tale of a man considering the value of smarts versus happiness has an edgy, post-modern feel to it, without so completely abandoning tiresome forms that he gives up the entire concept of story. Both Warren and Doctorow use an ironic touch that points out the incongruities of life. The humor helps in Warren's case to wash out any tinge of purple and in Doctorow's case to maintain a breezy, engaging style. It's worth noting that both have first-person narrators, who receive the reader's permission to tell the story any way they please, as long as the writer, in his persona as narrator, keeps it interesting and keeps us unconfused. Both succeed. For the student of backstory, it's a good contrast to explore. Something remarkable about All the King's Men (earlier post on the subject here). Between the Call to Adventure in disk 4, maybe, of 18 (here's a brief overview of the Hero's Journey and the stages; The Writers Journey: Mythic Structure for Writers is Christopher Vogler's indispensable handbook on using the monomyth in fiction and screenplay writing) and the Entry into the New World, which happens in disk 8 -- that is, between Willie Stark's demand that Jack Burden find something on the upright old judge and Jack Burden's first attempt to do so -- is roughly a quarter of the story. That's not a measure of the passage of the plot, because Jack says that he begins the assignment the very next day. In the interim, the author gives backstory on all the relevant characters. It's the right place, because the reader has already been hooked into the story by the three disks on the drive to Willie's home in rural Louisiana, 1936, and in fact, the backstory sets the hook deeper. We know now why it's important to Willie (the Huey Long character) and Jack (the first-person protagonist) to destroy the judge. More, it reveals the stakes -- what's the worst that can happen if it all goes wrong? And Jack tells us just at the edge of the threshold, on disk 4, that it all does go wrong; almost everybody is dead by the time the narrator gets around to telling the tale. But it's hard, as anyone will know who's ever tried to do it or has read with any sympathy an inexpert author's attempt to carry it off, to lay in a quarter of a novel in backstory without losing the way back to the present time. The writer is playing huge risks with the reader's sympathy (for the characters) and attention (many a book has been left on the table when the reader says, "Who? What? I give up"). It's easy for a writer to fall into a kind of, "Sit down and listen up. It's going to be good for you. This is what you need to know so you can get to the good part of the story." And readers (of whom I am first) are inclined to refuse anything that's good for us. If it doesn't taste like chocolate (or at least avocado), I'm off to look for something tastier. Warren pulls it off by putting it in scene and dialogue and characterization that never feels like "description." I don't think he could have pulled it off without Jack Burden being the narrator. Warren anchors the flashbacks and flashforwards several times by returning to that day in 1936. The day becomes a sort of direction pole set up in the story, so that when we circle back, we know where and when we are. But his technique has the words, "Professional writer at work. Do not try this at home," written all over it. On the other hand why not try it at home? A striving storyteller doesn't crash a car. He just fills pages with fiction that's too hard for him. But if you want to see an expert driver take a sport SUV through the slopes of the Andes, past volcanoes and roaring rivers and breath-stealing chasms, rent, buy, or check out this book. Election season is a lot like Lent. It's a clash of ideals and pragmatics, where all the vices come out on display, partly because of the fierce effort to, at best, keep them at bay and, at worst, to hide them from the view of others. It's a time when people on one side of the aisle are tempted to uncharitable judgments against people on the other side of the aisle -- or, for that matter, their own side of the aisle. Have mercy, O Lord, upon our president, and all in civil authority, and save them, together with the armed forces of our country. Give them peace and continual victory over injustice and evil in all places. May they keep Your holy Church secure, that all Your people may live calm and ordered lives in Your sight, in true faith and prayer, with godly deeds. The worst -- a naked grab for power. The problem is -- and here's the reason so many good people want to hide under their pillows until it all goes away -- it's hard from the inside to see where public service has become a power grab, and it's hard from the outside to see when what appears to be a naked power grab might be a sincere act of public service. And vice versa. 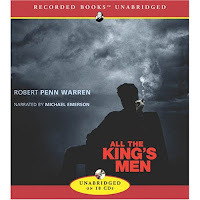 So when I was browsing through my county library and found a copy of Robert Penn Warren's All the King's Men on CD, I picked it up because, having lived in Louisiana, I knew a little about Huey Long, because Robert Penn Warren had been a poet laureate of the United States and I was interested in how a poet would handle a novel, and because I had been comparing the populist governor and aspiring president to a certain candidate in the current race. The reading has been even better than I anticipated. Warren, the poet, catches the rhythm of southern speech without even a tinge of purple. He shows the process of good intentions for public service turned to a naked grab for power. The reader, Michael Emerson, does the voices like someone who has lived all his life in Louisiana. For a look at the political process that's uplifted just by the art of telling, as well as the reality that very little really changes from cycle to cycle (of course, the stakes are higher than we think; it's just that they're always higher than we think), I highly recommend this one. UPDATE: OK, I'm stunned. The Michael Emerson who reads the book as if he's never been outside of Louisiana is the same Michael Emerson, born in Cedar Rapids, Iowa, who plays the creepy Ben Linus on Lost. I've moved beyond impressed at his acting ability to awestruck.